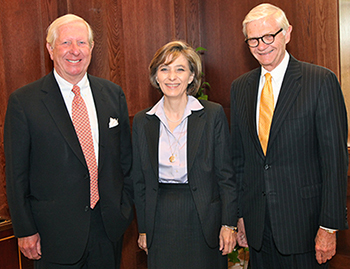 Conclave Vice Chair William R. Rakes; the Honorable Cynthia D. Kinser, Chief Justice of the Supreme Court of Virginia, who was honorary chair; and Conclave Chair W. Taylor Reveley III. The notebook materials distributed to all Conclave attendees is accessible on this site, including the reading materials pertaining to each of the four substantive panel discussions conducted during the two-day event. This site also includes the detailed substantive agenda, together with the transcripts from the panel discussions and presentations. 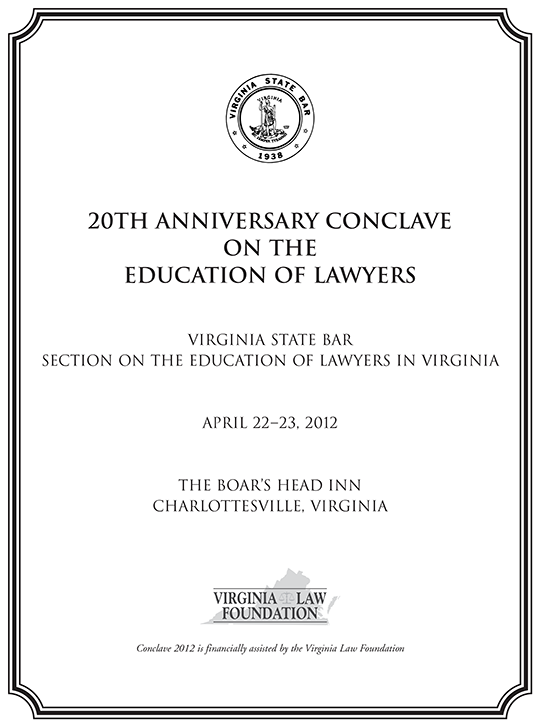 The October 2012 issue of Virginia Lawyer features a summary of the proceedings. See sidebar for this information. PANEL I – HOW ARE LAW SCHOOLS ADDRESSING MAJOR CHANGES IN THE PRACTICE OF LAW AND IN ACCREDITING STANDARDS FOR LEGAL EDUCATION? What have been the major changes in these two aspects of the legal profession in the last generation? To what extent are law schools responding creatively and effectively to them? Should law schools be doing more to prepare their graduates to practice law effectively from “day one” and to use their legal training productively in other careers? PANEL II - HOW SHOULD WE MEASURE PREPAREDNESS FOR ADMISSION TO THE BAR? To what extent do bar exams realistically capture competence for the practice of law? How effectively, for instance, do they test an applicant’s capacity to write? Do bar exams fail to take into account the contemporary reality that a rapidly growing number of lawyers have multi-state and international practices? Can we justify any longer having 50 different bar exams and confronting applicants with the steep costs of application fees and bar prep courses? Do the number and nature of tested subjects on bar exams constrain the capacity of law schools to reshape their curriculums to deal with contemporary needs in the profession, for instance, skills education? PROGRAM: Is There a Crisis in Legal Education? PANEL III – HOW DO WE MOST EFFECTIVELY SEEK TO EDUCATE LAWYERS THROUGHOUT THEIR CAREERS? What are the main ways in which lawyers continue to learn over the course of their legal careers? Which ones seem to be especially effective? Among these ways, what is the most useful role for mandatory CLE? To what extent does it now actually fulfill that role? PANEL IV – DO JUDGES HAVE A MEANINGFUL ROLE IN LEGAL EDUCATION? Since judges often see some lawyers’ abuse of precedent and statutory law, gross inability to write, and blatant incivility, should judges insist more forcefully on legal competence, ethical behavior and civility from lawyers appearing in their courts? To the extent judges are reluctant to do so, what considerations inhibit them (for instance, concerns about reappointment, limited time to intervene, or belief that intervention would be inappropriate)? Realistically can judges do more, and should they do more, to ensure the effective education of lawyers? Reporter: Hon. 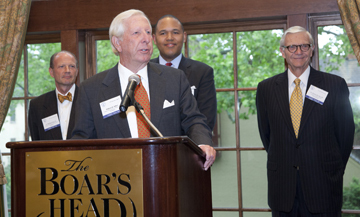 Walter S. Felton, Jr.
Hon. Walter S. Felton, Jr.